12 of the 23 April games are at home. How many should you plan to get to? Mar. 30, 2017, 9:15 a.m. Baseball season is here. For real. The weeks of pitchers and catchers and training in the spring sun while throwing grapefruits at each other is over (just think of how rough the Cactus League players have it), and it’s time for things to start mattering. The Big Leagues. The Show. The Grandaddy of them all. Wait…not that last one. The Phillies start the 2017 MLB season at Cincinnati this coming Monday for a three-game set before returning to the ever-so-friendly confines of Citizens Bank Park on Friday, April 7, for the home opener against the Nationals. Barring any rainouts — or, who we kidding with the weather this year, snowouts — the Phils play 12 of their 23 games in April at home. At every one, there’s some free giveaway or wacky promotion to get people to come to the stadium. Look, there was a time not too long ago where CBP was the hottest place in town, where everyone — from the Philly family-of-four to the local college bros more interested in watching who’s walking down Ashburn Alley than who’s rounding the bases on the field — would go. 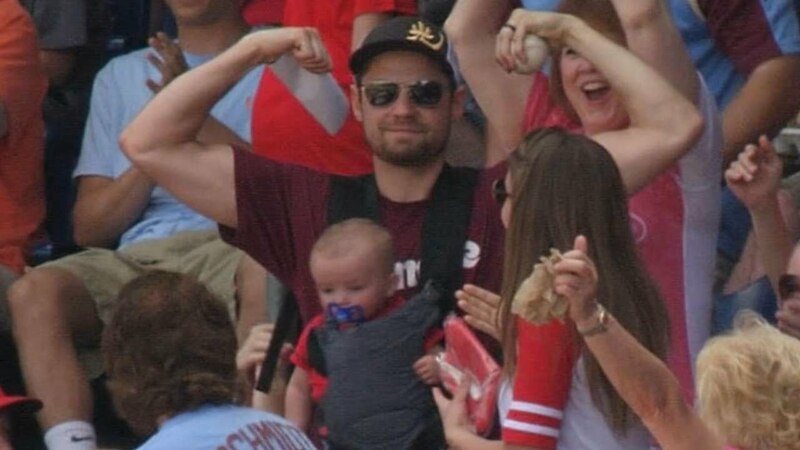 And there’s still a little of both down at the park — and some of the latter who have grown up these last nine years and turned into the dads with babies strapped to their chests catching foul balls, for sure. But the casual fan? Most of them are long gone. In 2009, the year after the Phils won the World Series (and the year fairweather memes like @FanSince09 were born) the team welcomed more than 3.6 million fans, averaging 44,453 per game. That average went up in 2010 and 2011 to more than 45,000. Two years later it was just over 37,000 per game and in 2014, with the third-highest payroll in the majors, it was down to under 30,000 fans per game. The last two years, while the Phillies have slowly started their rebuild, CBP averaged around 23,000 fans. That’s literally half of what they averaged just five years prior. There aren’t enough dollar hot dogs in the world to make up for that difference. Last year’s total attendance was 1.95 million fans, the seventh-worst in MLB, which has continued to put pressure on the marketing department to give fans reasons to show up other than mediocre baseball. Checking out the 2017 promotional schedule feels like when you accidentally click on a Groupon email there are so many weird deals and promotions you want to buy all of them but end up so overwhelmed you just delete it. Pasta for two followed by paintball and an hour in a bounce house? Sounds like Wednesday at the ballpark! In addition to the giveaways, there are theme nights, too. Ten of them in April alone, from Science Festival Day to the Phanatic’s Birthday to Greek Night (note: not about gyros, sadly) to…Swimmers Night, which let’s be honest, sounds really, really desperate. It’s a lot to take in, so we’ve ranked them for you. Here are April’s Phillies home games with their promotions, ranked by which you can’t miss, and which you can probably skip to watch on TV or check the score in the morning. It’s Opening Day! If there’s one game all year to be excited about, it’s the first home game of the season. Sure, the Phillies could be 0-3 by then, but they could be 3-0, too. Plus, based on the rotation, the first home game should feature Vince Velasquez on the mound. That’s reason enough to go. Dollar Dog Night is the greatest racket in sports history, and Monday against the Mets is also College Night AND “Red Goes Greek” night, were the first 2,000 fans that buy those tickets get a special “fraternity and sorority” hat. It’s bro-tastic, if that’s what you’re into. Everyone (while supplies last) can get a Phillies t-shirt in your school’s colors. Congrats Drexel and La Salle fans! Yours look hideous. One more promotion! Because why not cram five things into one Monday night game. It’s #CollegeSeries Baseball Analytics night, where people can sign up for a Q&A session with the team’s analytics executives, get a ballpark tour and hobnob with Phillies front office staff. Free t-shirt combined with the optimism of “it’s still early, maybe they’ll be good.” Plus Aaron Nola is fifth on the Phillies pitching rotation and this is the fifth game of the season so that’s cool. What’s that? He’s been terrible this spring and his last outing was a disaster? Hey look a free t-shirt! Another one of the #CollegeSeries nights, this one is pretty neat for wonky media nerds. Hang out with some of the Phillies marketing and media execs — sorry, no on-air talent, they have a game to prep — and learn about the business from those who put the Phillies on the air. Plus, the Student Steal promo is solid. For all these games in April, students get in for $15 and it comes with a voucher for food. Yes, the Phillies used the word ‘jawn.’ No, we won’t hold it against them. This season, the Phillies are offering a Student Steal – a $15 ticket, plus the first jawn on us! That’s right – Chickie’s & Pete’s Crab Fries, Bull’s BBQ, Tony Luke’s, hot dog & soda, basically anything you can eat or drink in Ashburn Alley – is included with your ticket. It’s a special offer for all high school, college and graduate students for games during the months of April and September! As Phanatic hats go, this year’s isn’t great, but he’s still the best thing the Phillies have to promote, and it’s a spring Sunday against the Braves, so not a bad game to go to. This is another one of those “throw a bunch of things into one game” in hopes different pockets of people fill the stadium. There is very little interest in the Marlins and Phillies on a presumably chilly Tuesday in April, but hey, they’ll give you free gloves to keep your fingers from freezing. And they’re touch-screen gloves, which for some reason only seem to work for a week or two. Does anyone ever use the free cell phone covers you get as giveaways? Will they keep your phone from breaking, even on the lightest of falls? Well on April 12, you get to find out! It’s also Scouts night (not baseball scouts, boy and girl scouts) and Finance Night of the #CollegeSeries for the Future Phillies GMs of America club members. Bring your resumes! This is a great night the Phillies do every year, where tickets are discounted $4 and an additional $4 from every ticket purchased through this program get donated to Autism Speaks. It’s also another $15 for a ticket and a “jawn” night for students, but compared to the other giveaways, this night feels a little tame. Plus, it’s a Saturday night. You probably have something else you can be doing. Available at select Thursday games and during Alumni Weekend (Aug. 11-13) for 200 fans, this special #ThrowbackThursday (#TBT) Emoji T-shirt features former players as emojis, designed to look like they did in their playing days. Among the former players to represent the Phillies as emojis on the #TBT T-Shirt: Tug McGraw (1980 World Series Champion Phillies), Juan Samuel (1983 National League Champion Phillies), Darren Daulton (1993 National League Champion Phillies), Pat Burrell (2008 World Series Champion Phillies) and of course, the Phillie Phanatic (the best mascot in the major leagues). In addition to the #TBT Emoji T-shirt, this special $30 #TBT Emoji Game package includes seats on the popular Scoreboard Porch (valued at $30) and a $12 concession value. For those 200 fans this is the number one game on the list (so sign up now). But for the 201st person to read this, click through and miss out on the emoji shirt, I’m sorry. What I mean to say is: ? The only thing better than a dollar dog is a free one shot out of a cannon. Over-under on the number of people at this game set at 18,500. Yes, even with wieners for a buck. Jackie Robinson is one of the most important figures in American sports history, but MLB has turned him into a posthumous commodity in an annual attempt to remind fans how diverse and inclusive the league is now. Only, there are still a ton of issues with diversity in MLB. But hey! Everyone wears Jackie’s number! Everything is ok! That said, it’s not why this day is last. Swimmers Night? Where people get swimming caps? How is this a thing, Phillies?